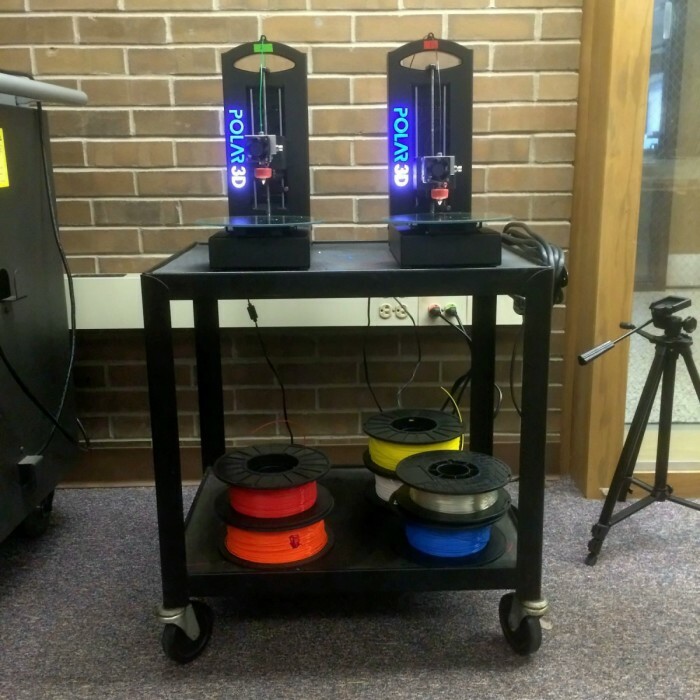 3D printers are a piece of equipment that deserve, if not require, a dedicated space in your classroom, makerspace, workshop, or wherever they are being used. One thing I have learned from working with 3D printers over the past few years, especially in a classroom setting, is that good organization is imperative to the success of the program. This can be achieved by taking a little time to set up a dedicated 3D printing space. When I first started 3D printing a few years ago, I found that repurposed AV carts work really well as printer stations! Don’t throw those carts out! They’re mobile, have enough space for two Polar3D printers on top, and the bottom shelf provides ample storage for several coils of printer filament and a small toolbox. I could easily move this cart in and out of my teaching space. This cart was particularly nice because it included a power strip and extension cord on one end that helped minimize tangled cords. Having a small selection of tools on hand along with a toolbox or other means of containment is a necessity. You won’t need a lot of expensive or application specific tools, and you will probably be able to get everything you need for $50 or less. Allen wrenches (supplied with your Polar3D) ­ for disassembling various parts and accessing the extruder motor. You may want to pick up an entire set as backup. Needlenose pliers with side cutters ­for cutting filament and removing pieces of filament that sometimes get caught in the extruder head. Screwdrivers - ­a reasonably sized Phillips ­head and flat­head screwdriver is always a welcome addition to any workspace. They don’t need to be huge and the ones with interchangeable heads are usually a pretty good bang for your buck. Calipers - ­wait, aren’t those for machinists, mechanics, and engineers? Yes, they sure are, and they are for you too now that you have a 3D printer. They are a great tool for making precise measurements of small parts and can be found on Amazon for around $15. Get some and use them, you’ll be glad you did. Tape measure - ­for larger items, a tape measure is a nice alternative to the classroom ruler. Dry Chain Lube - As recommended by Polar3D. This can be found at any bicycle store. The brand I use is Finish Line, but any quality lubricant should work. Easy does it; a little goes a long way. Eyeglass screwdrivers ­- These are not essential to your printing duties, but they come in really handy when working with very small screws in a variety of situations so I added them to my toolbox just in case. I picked up a nice ten piece set from Lowe’s for around $12. Box cutter ­- Check to make sure this is permitted at your school before making any purchases but a small blade has almost endless uses. A dedicated set of tools that are kept with your printers means they’re there when you need them. Now that you have this awesome selection of printer­specific tools (in addition to those required by your makerspace) you need to give them a home. Yes, you will, and they will grow legs and disappear forever. For the sake of your tools and the space you operate, lock them up. Also, keep in mind that unfamiliar tools in the hands of an inexperienced user can be a serious safety issue. Lock them up! A small, lockable toolbox can be found locally for around $15 and boasts enough space for all of your tools along with that roll of duct tape, power packs, maybe a spool of filament, etc. Some Plano tackle boxes could also be good options. Whatever you decide, make sure it will work for you. As my space continued to evolve, I debated as to whether or not I wanted to give up my beloved AV cart for something a little more robust. My final decision came down to being able to keep the printers themselves under lock and key. Am I concerned that someone is going to walk off with my printers? No, not really, but with the after school activities going on, along with who­knows­what else, they needed to be locked up. My toolbox purchase was funded by the endlessly supportive building parent association for less than $300. This tool cabinet provides an organized, secure, attractive 3D printing station. It came as a two-piece system with a chest of drawers for the top that I removed and use as a separate piece. It provides a lockable, organized, workspace for my printers along with the associated tools and parts. Perhaps somewhat of a pricey addition but I consider it insurance and have to say it really sets off the look of my printing station. I am a stickler for an organized toolbox. Nothing is more frustrating than not being able to find the tool you need when you need it or having a bunch of stuff in the way when you’re trying to work, especially when you have a classroom full of students. My workstation has drawn a couple of snickers from those who are less particular about things, but the bottom line is that it is organized, secure, attractive, and just plain works.